How is Zinc Oxide Manufactured? UI Zinc Oxide is manufactured by the French process in which the quality of Zinc Oxide is analyzed on the basis of standard quality control metrics. Beginning with the manufacturing process, the Zinc Oxide chemical is made volatile by the medium of heat and the vapor is drawn into an oxidation chamber to react with oxygen in controlled conditions. This helps in producing the particle size conforming to the desired Zinc Oxide grades. On cooling, zinc oxide is sampled & analyzed to check the conformity as per grade specifications. Statistical process and quality control measures are adopted to ensure the consistency and purity of Zinc Oxide manufactured. Zinc Oxide is used in many industries for production of goods and items ranging from rubber to ceramics, from pharmaceuticals to food and agriculture, and from paints and lubricants to cosmetics and healthcare products. Because of its characteristic physical and chemical properties as well as wide scale of radiation absorption, Zinc oxide proves to be the best fluxing agent for preparing frit and enamels. Being the most important application area, rubber industry ranks top in the use of Zinc Oxide. Almost 50% of Zinc oxide has been used over years in vulcanization of rubber for manufacturing tires, hoses, sports equipments, shoe soles, belts and other rubber goods. Zinc Oxide provides important pigmentary properties that increase the ability of rubber material to absorb frictional heat and enhances the performance of automobile tires. Zinc oxide manufacturing technology is evolving fast to meet new industrial needs. One such area of ZnO application is ceramics industry where it is used as an extremely versatile chemical compound. Zinc Oxide is recommended as a standard adhesive in manufacturing of ceramic tiles as it reduces the melting temperature of glaze and allows other ingredients to produce intrinsic colors. ,h4>Zinc Oxide in Paints & Lubricants Zinc Oxide is used in niche paint and pigment Industry as it helps in providing anti-corrosive coating for metals. It is still used in the composition of antifouling paint in ships and marine transport. Zinc oxide is also present in glass of cookware tops due to its strong heat resistant properties. Engine lubricating oils contain Zinc Oxide as a basic ingredient that helps in improving the performance and serviceability. Acting as a catalyst for growth performance, Zinc Oxide is found as an additive in dietary supplements, and multivitamin tablets. Due to its light reflective properties it is also used as a sunscreen pigment SPF to help deal with skin burns and even dandruff. It’s highly antibacterial and deodorizing properties help treat the skin irritations and it is used as an advantageous chemical in baby powders, shaving creams, and beauty products. Zinc Oxide is a necessary nutrient that is required by our body to ensure proper metabolism. A mineral-rich variant of Zinc Oxide is added to food and dietary cereals to prevent the growth of harmful microbes. Because of its fungi-static properties, it is used in the packaging of grocery items, animal feeds, and frozen foods as well. It is also added to fungicides and is used in agricultural applications to increase the crop life and productivity. 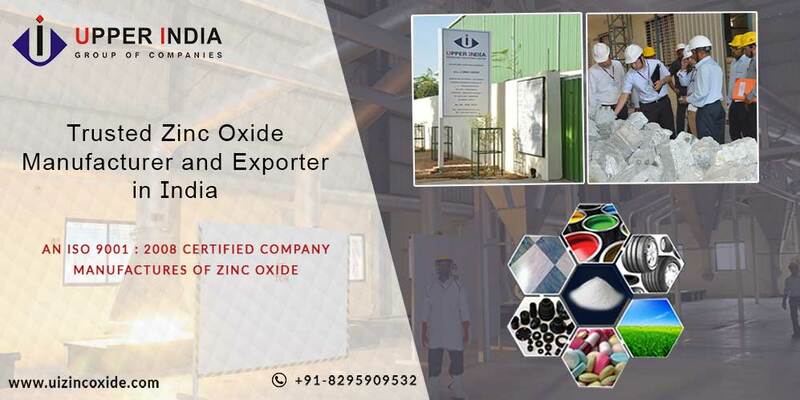 Upper India is an ISO certified company and a leading manufacturer and exporter of Zinc Oxide products in India. Since 1959, we are manufacturing different Zinc Oxide grades for catering the multiple industry needs like tires, rubber, glass, paints and ceramics, cosmetics, agriculture, food, medicinal supplements and other chemicals.